There is good news and bad news as far as recycling for Oyster Bay. 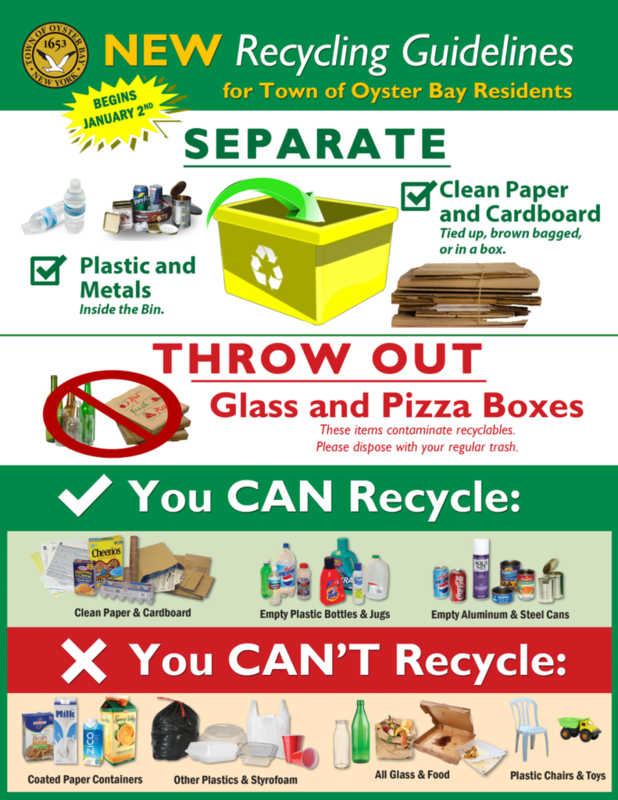 Residents can still put out their plastic, metal and paper once a week (though the town requests that paper be put outside the recycling bin—see illustration). But the town itself will go from being paid $25.08 per ton to paying $69.75/ton under a contract beginning Jan. 1. And as part of the new contract, residents can no longer recycle glass and “dirty” cardboard. The town board, at the Dec. 11 meeting, voted unanimously to approve a new intermunicipal agreement with the Town of Hempstead Sanitary District Number One to haul away the recyclable material that is picked up by the town’s sanitation department on a weekly basis. Earlier this year, the Chinese government’s policy of restricting the amount of recyclables it accepts threw a wrench into the market. As a result, Winters Brothers Hauling informed the town in July that it wanted to break the contract it had signed last year, in which it paid the town $25.08 to haul away its commingled (single stream) recyclables. Winters—which also has the contract for the town’s solid waste—was seeking a new rate of $65/ton. After negotiations, Winters agreed to keep the terms of the contract until the end of 2018 and in turn the town would not exercise the first of its four one-year options. Lenz said the material, after being taken to the town’s Old Bethpage Transfer Station, is then loaded by town employees onto tractor trailers belonging to Sanitation District Number One’s contractor, Omni Recycling of Westbury. Lenz noted the contract was for two years, and when Councilman Anthony Macagnone wanted to know why the town committed itself to a fixed payment when the market was so volatile, Saladino interjected to say that either party, with 60-day notice, could break the contract for any reason. “We wanted a situation that did not radically change the pattern our residents have been accustomed to,” Saladino explained. In response to Macagnone’s inquiry, Lenz said the town currently pays $86.75/ton for the 120,000 tons hauled away from its transfer station. It generates about 17,000 tons of recyclable material, and under the new contract this will cost the town about $1.2 million next year. Town spokesperson Brian Nevin said the recycling contract with Winters Bros put about $500,000 into the town’s coffers.